Posted on February 9, 2012 February 9, 2012 Categories Brutal Reality, Sweet MemoriesTags ashwin, cricket, dhoni, gambhir, Gautam Gambhir, India, irfan pathan, Mahendra Singh Dhoni, parthiv patel, rohit sharma, Sachin Tendulkar, Sehwag, Sri lanka, Suresh Raina, umesh yadav, Virender Sehwag2 Comments on India won, barely. What next? This will be the biggest mistake that BCCI can possibly do at this time. India has seen a lot of success in recent past under Dhoni. Given, last 7 months have also seen India slump in the Test Format, but scaking Dhoni is the last thing Indian Cricket wants to happen. Dhoni has come out and sent a clear message in what I feel is the political correct way, that we do not have any one else who is best suited for the job. Dhoni is captain cool and handles pressure very well on the field where others have failed. He sure needs a team around him to perform, he can only do so much as a captain. As a leader he has the responsibility of the team success and failures and there are things he needs to do with the help of BCCI, but sacking him is something that should not happen. With the rumor around some of the senior players exiting the team, we cant afford changing the captain. Gambhir, Sehwag, Yuvraj or Kohli need to focus on the roles they play in the team which is not captaincy. 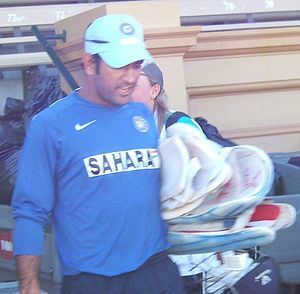 Lets hope we continue to have Dhoni as the captain until we can build a plan around the changes. If some of the senior players go, he will have to take a lot of flack on failures if younger players take time to come around, but he is the best person who can take that pressure and keep it away from the field. I wish him all the best for the upcoming year. Posted on February 1, 2012 Categories Brutal Reality, Sweet MemoriesTags bcci, captain, cricket, dhoni, India, memory, RealityLeave a comment on Sack Dhoni? It was in July-Aug 2011, during the Patoudi Series when India lost their #1 ranking to England. They lost the series 0-4 and it was pretty humiliating as it was coming off the famous World Cup win in April 2011. India’s win in World Cup kept India safe from the criticism. However, the dust storm was waiting to unleash itself, yet no one surprisingly saw it. Everyone was hoping that 0-4 loss to England was one off thing. And, then came the Agneepath series (Border-Gavaskar series) and all hell broke loose as India lost first 3 test matches to Australia in a humiliating fashion. As i write this post, yesterday was when India lost their 3rd test match and hence loosing the series as well. And thus started the blame game. This article summarizes quotes from many great players and I would agree with all of those, it simply suggest one thing – Dhoni and selectors have been waiting too long trying to ride the “luck” Dhoni has had. And, yet their Karma has expired finally. Things do not happen on their own, they happen because someone needs to do something about it. Thinking that everyone will keep doing their job which was half as good as Australia did when they were at their peak was calling for trouble and trouble came calling. Srikkanth, stuck to his belief that the failure of the batting line-up was behind India’s abject performance on the tours of England and Australia, though he said it was too soon for a post-mortem of the series. “It is the same problem that we had during the England series. In the last two series, the batsmen have struggled to find form. I don’t think too much of a post-mortem will lead us anywhere. all teams had disappointing periods in cricket, and that the Indian team management would take steps to ensure a better performance on the rest of the tour. “We admit that the team’s performance has not been up to expectations,” he said. “But it happens with all teams. Recently, former world champions Sri Lanka were all out for just 47 [43, against South Africa in Paarl]. What Shukla said is perhaps right, we do not say a lot when all is going well, and when things start to go wrong everyone feels it is everyone’s right to critisize. And IT IS. We are fans, who view the sports, who make it what it is. We are the ones who make Cricket what it is. If it was not for us, Cricket may have just faded like Hockey in India (which turns out to be our National Game). Yet, Shukla seems worried about the criticism. I wonder if this is because he was also riding Dhoni’s luck. Enough of criticism; I believe in the philosophy that if you see a problem, bring at least one solution on the table. India cricket needs a higher calling; they need to work on getting their home in order. Having spin pitches for international matches is not a bad thing. If Australian curators prepare fast pitches to give their team the advantage, India curators should do exactly the same. But, that should not stop us from getting our international team some practice on fast pitches during Duleep trophy and other domestic formats. I am not sure, how many of our international players play domestic format. But, there has to be a way of bringing up the right talent. Why can we not have specialists for Test Cricket who can have the edge in foreign soil; time is now to find methods that go beyond the conventional methods. We need to reinvent the way we are selecting players. Pace academies have to be setup. Seeing a little of all matches in recent series, I can say with certainty that Australia’s bowling attack was not invincible like in the past. They won because of their consistency. We need to get our bowlers the same set of consistency – bowl 6 of 6 bowls in the same spot and then we will be what others. Lets have different coaches for each division with a head coach (a strategy followed by many American sports). Let specialist focus on the problem to solve it. Lets hope someone does something. We can afford letting go of all senior players in a flash. We need the right mix of experience and fresh blood. As Anil Kumble said – we need to have a transition plan to make it work. We are already late by 12 months, but we have to salvage all that we can. India once again failed to cope with the swing, seam and disciplined line of the home attack, comprising Ryan Harris, Ben Hilfenhaus, Peter Siddle and Mitchell Starc. Upon his dismissal of Laxman, Siddle sank to his haunches, in a sign of how much a hot day in Perth had drained Australia’s bowlers despite their regular wickets, and he did not re-emerge after tea. via Australia v India, 3rd Test, Perth: David Warner’s blazing ton destroys India | Australia v India, 3rd Test, Perth, 1st day Report | Cricket News | ESPN Cricinfo. On Sunday, during the 2nd test match between India and England something happened that has once again trigerred the debate of “what’s the right thing to do?”. It was the Ian Bell’s run out and India’s decision to take the appeal back allowing him to come out and bat again. The next day, India lost the test match in a very humiliating manner; however Ian Bell added only 20 more runs after being recalled and his recall had no influence on the result of the test match. Yet, the media has started to talk about it in all sense. Not just media; some people I know are also talking about if it was the right thing to do. If you read about the dismissal and watch it on YouTube, you will realize very soon that Ian Bell was out as per the rules and there was nothing wrong on part of Dhoni to make the appeal. It is a simple fact that umpires reviewed the same, and eventually ruled Ian Bell out. 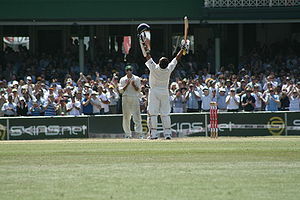 All of this happened within a day of another incident where VVS Laxman was accused of cheating by Andrew Strauss. An article in Times of India shows two sides of what people are feeling. One side said – “Why does India have to be on the good side always, when teams like Australia and England do all sorts of things in this Gentleman’s game”. The other side says – “We don’t want to follow or setup wrong examples. They can do what they want to; we will do the right thing”. In another article, they revelaed the influence Sachin had on this decision; goes to show the kind of leaders we have in our team how great this team is. It was “right” to dismiss Ian Bell; he was silly to take the run; but it was also “right” to recall because of the confusion. When I think about it; it seems like a choice I have been asked to make so many times – “The Practical thing” vs. “The Right thing”. India decided to recall was the right thing to do; although it was not as per rules. They could have decided to let go of Bell and play on and nothing would have been wrong about it as per the rules of the game, but it would have be such a sad thing to do. All those people who in India, who are currently critisizing Dhoni for this; are not thinking if there was a role reversal and it was Sachin Tendulkar instead of Ian Bell. In most cases, knowing England they would not have recalled him; just think how we would have felt about it. We would have been all over the English side and critisizing them for this “right foresaken” thing. But, now when we have chosen to do the right thing – why are we upset. We should be happy that we have a team who thinks on moral ground and while they play to win, they also understand the importance of fair play. In some sense I am happy that I did this and sad that no one in BCCI or Indian camp is talking about it. Unless we know where we are we cant look to get better. We need to know our missing points. I rather be a critic to point out the things that didnt go well for my team than be a fan who sits back and enjoy what could be a short-lived victory. I am forced to make to make a comparison with good intentions towards my team. I know, some people will still think me being naive to think all of this and not just be happy, but I want someone to listen and maybe they do. It started a few days back when my cousin started to propagate Dhoni’s leadership skills over the team members in CSK in IPL. I had liked Dhoni always, but the fan base that called out Dhoni’s captaincy so good that it started to show off other players in the team worthless – was something that ticked me off. In one of the discussion my cousin actually mentioned that players like Bollinger and Raina and Morkel are performing because Dhoni was motivating them. I took it personally because it meant that the WC victory was only Dhoni’s doing and so was every feat India has achieved in Cricket in last few years and it was hurting. I know she meant no harm and she loves Indian cricket as much as any other Indian, but it was the ticking point for me. All of this went into hyper drive when I had another discussion with Vineet Malani on Facebook where he was chanting about Dhoni’s captaincy and ignoring facts of what has happened around India and world of cricket. His point was simple – all that India has achieved is because of Dhoni’s captaincy and I wanted to tell them No – any captain in this scenario would have does what Dhoni has done. I do agree to the fact that Dhoni is a good captain and maybe the best of what India has had, however he is not Great. However, in my zeal to find facts I ended up dissecting India’s path to being no#1 in test cricket and it was a revelation. In my post Deep dive | India route to Test#1; I ended up finding that we are where we are because of the fact that Australia failed to achieve the top standards they have been in the past. India’s efforts have only been marginally better than those of Australia between a period of 2008-2010. And, it was so hurting for me to realize that we are just as good as their worst. I do hope that going forward we can do so much more better than we have in the past and take it to the top level cricket. Australia between 2005 and 2008 have had 70% winning percentage and only 15% each of lost and draw. We managed to equal their worst performance to be #1. India team – please do so very well in future; my best wishes are with you. Dhoni you are lucky for India and I wish you can take us to peaks where we are untouchables just like Australia were a few years back. I wish that day comes and I will write about you and how you took us to be on the top of the world so convincingly; where we will set benchmarks. I blogged about some stats and when i was cross checking I noticed something was off and I did the correction. Also, while i was doing the corrections, I wondered what attributed to India taking #1 position and how did Dhoni impacted that revolution. What I found was a revelation of facts that a lot of is was favorable and because of Australia and SA not doing their best and India matching up their worst or just being a little better. To begin with the correction from earlier post is: India streak in tests not loosing a match is 14. Started on 10/9/2008 against Australia (Draw) and ended when they lost to SA on 2/6/2010. during this period India went from 3rd position (100 points) to 1st position (124 points). Also note that during period Australia dropped from 141 points to 116 and SA went from 116 to 120 points and were 2nd in rankings when they beat India. Australia were loosing heavily and given their better win rates in 2004-2007, they were loosing points because of the 3-year cumulative match in the ICC Ranking system. That how even in some periods where they were not loosing, they were loosing on points because they played lesser cricket and were playing against teams way below them compared to in 2004 where they were facing top teams. South Africa were kind of neutral, but definitely played more matches abroad and had series against India and Australia consistently. Also, note that India remained on top because their Loosing % is significantly higher than other two, while their win percent is almost same. This means they were drawing a lot more than others. Overall, it clearly presents a case where India has been more conservative on their test playing strategies – playing less, playing at home, don’t loose and play safe to draw. Now – please tell me what did Dhoni do to take India here – it just happened. With a good team and safe strategy forces were in our favor. I am happy we are number one, but Dhoni did nothing in all this to happen. As a captain he could not do what all others in the past have struggled – improve our performance overseas. Change that – and then be called a Great Captain.